A perennially popular way to pamper yourself, or a loved one, is going on a get-away trip to somewhere that doesn’t quite look or feel, like home. As much as we are fond of our close-knit relationships with friends and family, a certain 'allure of the unknown' always lingers and gets us packing our bags and jet-setting to someplace idyllic and fascinating. Some seek adventure, exploration, and excitement; some hope to find peace and tranquility, away from what they may have grown accustomed to. As purveyors of great ways to pause, we gladly accepted the opportunity to be guests at Pangkor Laut Resort, located off Ipoh, Malaysia. Traveling from Singapore, we arrived at the Ipoh International airport in under 90 minutes and immediately spotted our names on placards held up by resort staff – it’s always nice to be greeted by people who are expecting you. We’re led to a luxury van waiting for us outside, and are told to hop on, kick back and relax, as we embarked our next 90 min journey toward the jetty, where we’ll then take a 10-minute chartered speedboat ride to the private island on which Pangkor Laut Resort is situated. On paper, it all seems like a huge logistical feat to get there, but the connections were seamless. 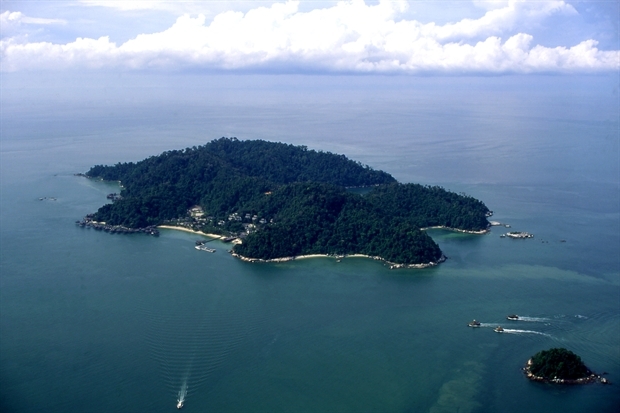 Before we knew it, we were all aboard said boat going full-speed across a water body known as Pulau Simpan – which roughly translates to, ‘kept island’. We set sail at just the right time – a few hours past noon. The sun was brilliant, but not too harsh, striking the blue waters at just the right angle to give rise to that magical glistening effect that our instagram stories worked hard to capture. As we approached the shores of the island, we noticed that we didn’t really see a resort per se. Instead, we saw an entire island, teeming with jungle life, majestic rock formations and complemented by neat clusters of wooden atap bungalows elevated on long stilts above calm waters – testimony to the careful way the resort was integrated into the natural geographical formations of the island. “Those bungalows you see ‘floating’ above the water are mostly part of the Spa Villa and Sea Villas,” says our companion on the boat. We didn’t yet know what the other options were, but already we agreed that those bungalows on stilts would suit us just fine. We’re welcomed warmly by Nora at the reception, as she proceeded to tell us about the 300 acre island teeming with lush rainforests. Apart from the Spa and Sea Villas, there was also the option of Hill Villas that overlook the surrounding views from up high, Garden Villas situated in close proximity to the resort’s commendable dining locations, as well as the Beach Villas stationed near the beautiful naturally-formed Emerald Bay – a beautiful half-mile long beach named after its clear waters. “While all the locations are equally stunning for their own reasons, you’ll be residing here, at the Spa Village, for the duration of your stay,” says Nora with a smile while circling the location on our handy map. Mental note to ourselves: Score! We don’t really think any other villa would have suited PAUSE better than a villa right smack in the centre of a ‘village’ dedicated to wellness and relaxation. We confirm this for ourselves as we round the bend on the wooden bridge leading to our designated home for the next few nights – we are loving the structure of the villa itself as well as the breathtaking views all around us. We quickly embrace the 55-square-metre villa as our home away from home. 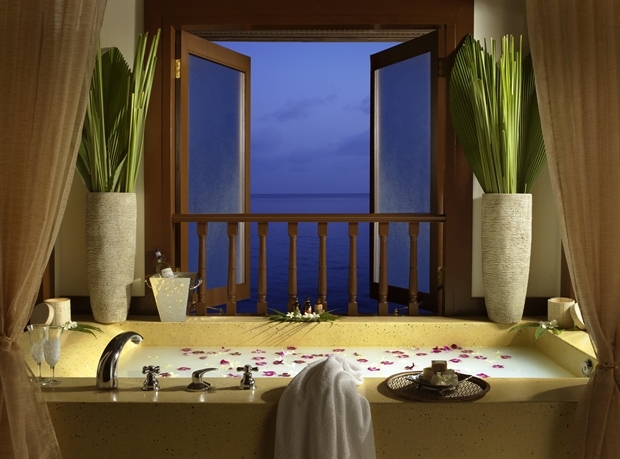 With its luxurious bathtub modeled after the Suci Murni concept (which roughly translates to 'immaculate and pure'), large wooden window panes that open up to the sea, soothing natural wood interiors fashioned after the Malay way of life, and a sunbathing balcony for unforgettable sunset-watching – what’s not to love? As we sipped our refreshing glass of ice cold lemon grass tea at the spa reception area, we couldn’t help but feel floored by the extensive ‘Spa Menu’, which offers a plethora of treatments that reflect the unique health rituals of the South East Asian region. We attempted to look as though we’ve seen something as extensive before, but there was no hiding our excitement. We each have one human body (no kidding) – was there any way that we could try everything?! Thankfully, our recommended 3-hour itinerary did manage to pack in a wide range of relaxing bath rituals, which began at the venerable Bath House. While it was not anywhere close to us being able to experience the entire menu (a girl can dream), it was a start. Moreover, we were able to select a massage of choice (between us, we chose the 80-minute Malay and Balinese massage - we both still debate strongly about which one was better.). From the fatigue-cancelling Chinese 'foot pounding' massage, to the soothing Malay and Japanese bath sanctuaries, as well as the awakening Shanghai bath scrub – we really could not choose a favourite. Each bath had its own strong suits and therapeutic aspects. What we feel really defines the Spa Village, and we dare say the entire resort, is its focus on wellness via traditional medicine and traditional healing rituals. These wellness experiences are in their own league, as they encapsulate the treatments and therapeutic arts of the individual ethnic healing traditions found in the region. CHINESE HERBAL HUT – According to traditional Chinese healing, the body is seen as a ‘harmonious whole’, where health is achieved by maintaining the body in a delicate balance of Yin and Yang – when the correct balance of forces exists, one’s ‘essential life force’ or ‘Qi’, naturally is allowed to flow uninterrupted throughout one’s Meridians, which are pathways that connect one organ system to another. Guests have the opportunity to seek the advice of the resident traditional Chinese medicine doctor during their stay. MALAY HUT – Traditional Malay medicine has its roots in more than 1,000-years of history. The Malay people believe that the ‘4 elements’, Earth, Water, Fire and Wing, make up the human body. The balance of these 4 elements allow one to achieve physical and spiritual well-being. The Malay traditional doctor is also present at the Spa Village - guests are encouraged to seek his counsel, as required. ARYUVEDIC HUT – Ayurveda is an ancient healing tradition originating from India, meaning ‘science of life’. We had the opportunity to speak to resident Ayurveda doctor, Dr Jeetendra Panda, about what he offers guests seeking Ayurveda medicinal wisdom or counsel. “One must choose their spa session type and duration, which can range from 3 days to 3 months, according to the lifestyle they lead. For Ayurveda, it primarily caters to guests who would like to regulate inner body functions, alongside the relaxation of the mind. I am also here to give personal advice to guests regarding the appropriate duration of a wellness programme, the detoxification of one’s digestive system, treatments that focus on reinvigorating the brain and the respiratory system,” shared Dr Jeetendra Panda. 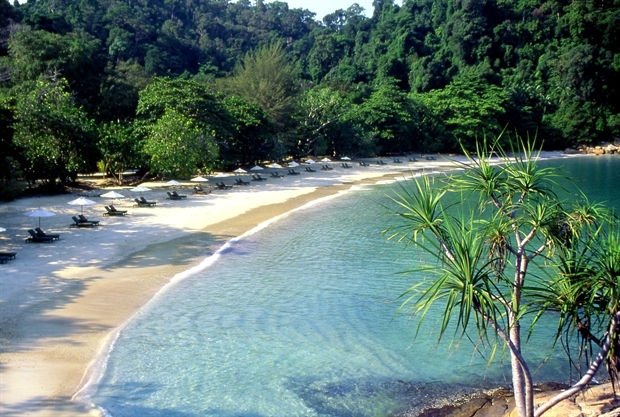 One month on: We're still reminiscing our rejuvenating experience on the magical island of Pangkor Laut. Truthfully, we would not hesitate to head back to the resort, nor would we shy away from recommending it to friends and family. There are few hospitality enclaves in the world with such a dedicated and passionate wellness initiative in place – and for that reason alone, it is worth checking-in to. 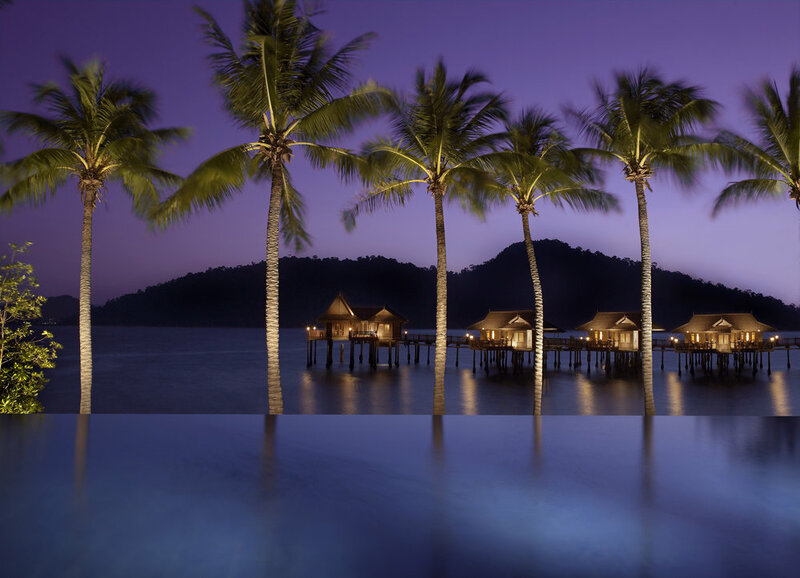 *For more detailed information about the full range of spa, wellness programs and health rituals offered at Pangkor Laut Resort's Spa Village, please visit this link.